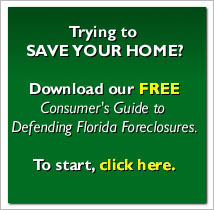 The State of Florida announced this month that it has shut down a web of fake law firms operated by a gang of foreclosure rescue scammers who pretended to be lawyers, and in the process, stole up to millions of dollars from unsuspecting homeowners. To learn more about the scam and how to protect yourself, check out the article by Ricardo & Wasylik. Your debt forgiven? Fifteen million dollars of debt forgiven by John Oliver. Is Smith, Hiatt, and Diaz (SHD Legal) about to go under?